We are different. We are one. Händel, Mozart, Rossini, Bellini, Verdi, Offenbach, Bizet, Sullivan, Puccini, Strauss, et al. Launched at a special presentation at the Supreme Court of the United States in 2013, Scalia/Ginsburg received its world premiere production in 2015 at renowned conductor Lorin Maazel’s Castleton Festival, followed by a sold-out second production in 2017 at The Glimmerglass Festival. In 2018, Opera North’s production of Scalia/Ginsburg debuted a new chamber orchestration by the composer. In 2019, OperaDelaware’s production of Scalia/Ginsburg debuts a new full orchestration. In 2020, Scalia/Ginsburg will receive a new production at Toledo Opera. Justices Ginsburg and Scalia wrote prefaces to Derrick Wang’s libretto, an early version of which was published in the Columbia Journal of Law and the Arts and excerpted in Justice Ginsburg’s 2016 book My Own Words. Click/tap any of the headings below (denoted by the + symbol) for more details. Scalia/Ginsburg is a one-hour English-language comic opera suitable for both mainstage and intimate venues, with a cast of three singers, minimal scenic demands, and accompaniment by either Gilbert & Sullivan-sized orchestra or 7-player chamber ensemble. Written on a contemporary American topic, composed in a highly accessible musical language, and featuring numerous references to famous operas, Scalia/Ginsburg is intended to delight first-time and long-time opera- and theatergoers alike. Duration — ca. 60 min. To inquire about a license to produce Scalia/Ginsburg, visit the Contact page and complete the form “I want to produce ‘Scalia/Ginsburg’”. What happens when Supreme Court Justices go before a Higher Power? In this comic opera, Justices Ginsburg and Scalia must pass through three cosmic trials to secure their freedom. The catch: they may have to agree on the Constitution. Derrick Wang’s Scalia/Ginsburg is a valentine to law and opera, where the law’s leading players go toe-to-toe and trill-to-trill in a (gentle) parody of operatic proportions. Opinions will be offered. Dissents will be delivered. And justice will be sung. Justices Ginsburg and Scalia wrote prefaces to Derrick Wang’s libretto [script], an early version of which was published in 2015 by the Columbia Journal of Law & the Arts. Excerpts from the libretto are republished in Justice Ginsburg’s 2016 book My Own Words as the chapter “The Scalia/Ginsburg Opera,” the audiobook version of which is narrated and performed by the composer-librettist from New York’s Steinway Hall. After the passing of Justice Scalia, the libretto was revised for the 2017 production of Scalia/Ginsburg at The Glimmerglass Festival. A buddy comedy with an operatic twist, Scalia/Ginsburg reflects the witty style of its subjects by applying “operatic precedent.” Like a Supreme Court opinion, the score of Scalia/Ginsburg is a mosaic of allusions to influential statements of the past. Originalist rage aria, in the style of Händel. Patter aria, in the style of Rossini and Gilbert & Sullivan. Bel canto cavatina, in the style of Bellini. Competing insertion arias from Verdi and Mozart, in the spirit of Offenbach. Aria and variations in evolving styles, including opera, jazz, and gospel-pop. Lyric aria, in the style of Puccini (but American). Sinfonia concertante da camera, in the style of Mozart & the Mendelssohns. Trilingual trio, featuring Puccini & R. Strauss. What’s next for Scalia/Ginsburg? Sign up with your email address to receive news and updates. On June 27, 2013, the day after the Supreme Court’s decision in United States v. Windsor, composer-librettist Derrick Wang appeared at the Supreme Court to present selections from his new comic opera, Scalia/Ginsburg. 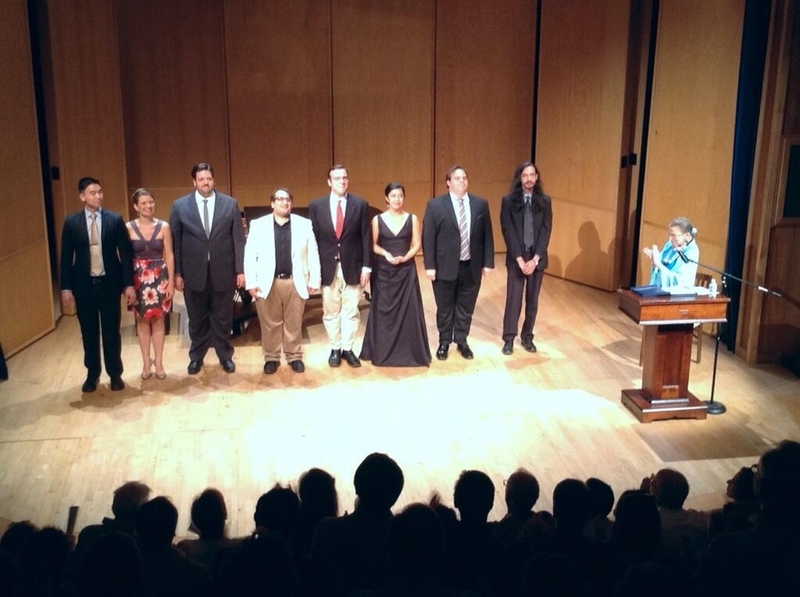 After being launched at the Supreme Court, excerpts from Scalia/Ginsburg were presented at the Washington National Opera, Glimmerglass Festival, Castleton Festival, Maryland Opera Studio, National Constitution Center, Second Circuit Judicial Conference (co-sponsored by Columbia Law School, with artists from Opera Saratoga), and Stanford Arts Institute & Stanford Law School. For more information, listen to Nina Totenberg’s coverage of the Supreme Court presentation — and see Derrick Wang’s TEDxBroadway talk on his journey with Scalia/Ginsburg from the Supreme Court to the stage. In July 2015, the world premiere production of Scalia/Ginsburg took place at the Castleton Festival, founded by renowned conductor Lorin Maazel in Castleton, Virginia. Audience members react after the sold-out world premiere of Derrick Wang’s opera Scalia/Ginsburg at the Castleton Festival founded by Lorin Maazel. In August 2017, Scalia/Ginsburg received its sold-out second production in a revised version at The Glimmerglass Festival, the second-largest summer opera festival in the United States. Acclaimed tenor William Burden, celebrated for originating lead roles in major American operas, sang the role of Scalia. The final performance was followed by a Q&A with U.S. Supreme Court Justice Ruth Bader Ginsburg. Scalia/Ginsburg has also been a featured topic on the ABC TV program Who Wants to Be a Millionaire?. ‘Who Wants to Be a Millionaire’ host Terry Crews asks a question about opera and the Supreme Court. Composer-librettist Derrick Wang talks about his opera Scalia/Ginsburg with Bloomberg Law’s Spencer Mazyck. Listings refer to presentations of excerpts (unless otherwise specified). Rathbun Visiting Fellow 2017, Ruth Bader Ginsburg, Associate Justice of the Supreme Court of the United States, shares the background of Derrick Wang’s opera Scalia/Ginsburg while in conversation with The Rev. Professor Jane Shaw, Dean for Religious Life, on February 6, 2017 in Stanford Memorial Church.